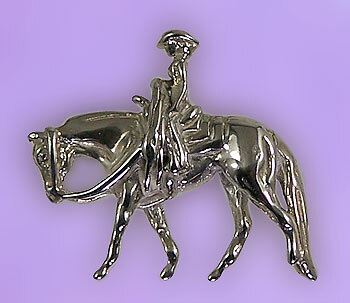 "Quarter Horse Pendant with Rider"
Great for the Quarter Horse lover. The Gorgeous Horse, your number one destination for custom Quarter Horse jewelry. Here we have a female riding a Quarter Horse. This pendant is very detailed and realistic, it's also light weight and great for everyday wear. Available in 14 kt yellow gold and 14 kt white gold and sterling silver.